The orientation of the Atlantic salmon (Salmo salar) IGH locus on the chromosome 6 (locus A - Salsal ssa06) is reverse (REV). Colors are according to IMGT color menu for genes. The boxes representing the genes are not to scale. Exons are not shown. A double slash // indicates a gap in genome assembly. Distances in bp (base pair) or in kb (kilobase) associated with a double slash are taken into account in the length of the lines and included in the numbers displayed at the right end of the lines. A dotted line ... indicates the distance in kb (kilobase) between the locus and its bornes (5' borne and the most 5' gene in the locus and/or 3' borne and the most 3' gene in the locus) on the top and bottom lines, respectively. These distances are not represented at scale and are not included in the numbers displayed at the right ends of these two lines. IGH gene names are according to IMGT nomenclature . Single arrows show genes whose polarity is opposite to that of the D-J-C-CLUSTER comprising IGHD (D1 to D9)-IGHJ (J1 to J5)-IGHM-IGHD. The orientation of the Atlantic salmon (Salmo salar) IGH locus on the chromosome 3 (locus B - Salsal ssa03) is forward (FWD). 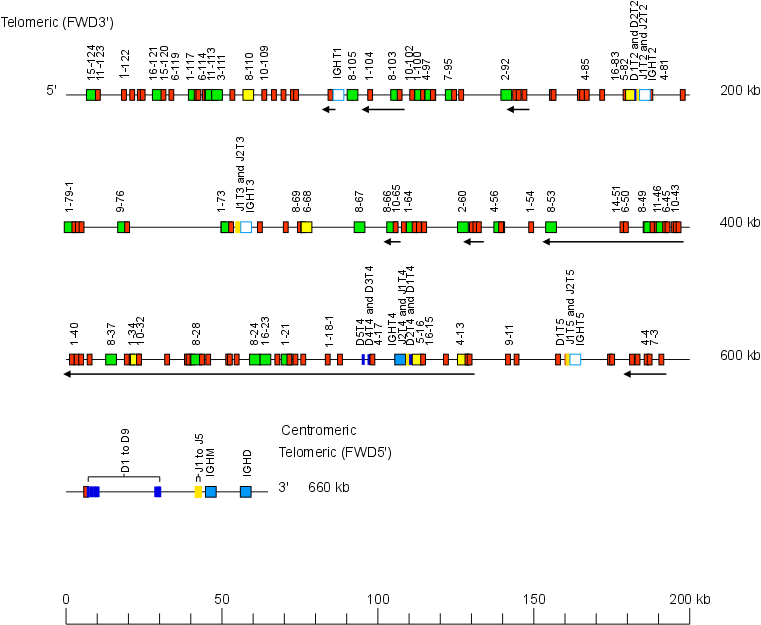 Single arrows show genes whose polarity is opposite to that of the D-J-C-CLUSTER comprising IGHD (D1D to D6D)-IGHJ (J1D to J5D)-IGHMD-IGHDD.